Do you want to collaborate on private projects within a workplace team? Perhaps you want to restrict content to paid subscribers? Or you might want to share photos and updates among family and friends. You may even need to distribute online training. You can do all this and more with a WordPress private blog plugin. With the right tools, it’s surprisingly simple to create a WordPress private blog. In this guide, I’ll show you how to protect your blog content in just a few minutes by changing its visibility. We’ll first start with the “why”, and show you some example use cases of private blogs, and then get into the “how” of doing this on your own blog – including advanced features such as a convenient user login page. By the end of the post, you’ll be totally prepared to do this yourself. You’ll learn to create password protected and private blog posts using the popular plugin, Password Protected Categories. Create a WordPress private blog today! You can get a head start by getting the plugin right away, or continue reading for the “why” and then the “how”. Let’s make a start. Why create a WordPress private blog? A WordPress private blog allows you to protect some or all of your posts. 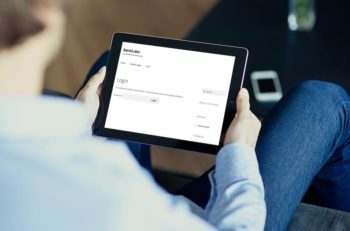 You can also choose how users access this protected content: either using a password, or by logging into their WordPress user account..
It’s a good idea to take some time to consider whether, for your particular blog, you want to protect some of your posts or all of them, and how you want users to access your content. Subscription blogs: If you offer paid or tiered content, a WordPress private blog plugin is ideal. You might even choose to keep some of your posts public, while protecting others in order to entice new subscribers. Community building: A completely hidden blog is a great place to share news and updates exclusively within your community. Membership levels: Do you run an organization or club with different membership levels? With a private blog, you can choose which posts are visible to which members. Client areas: You can share content with specific types of clients, or even create special areas within your private blog for individual clients. Workplace communication: Communicate important, private news and updates to your staff members. Or create a space to collaborate on private projects within a workplace team. 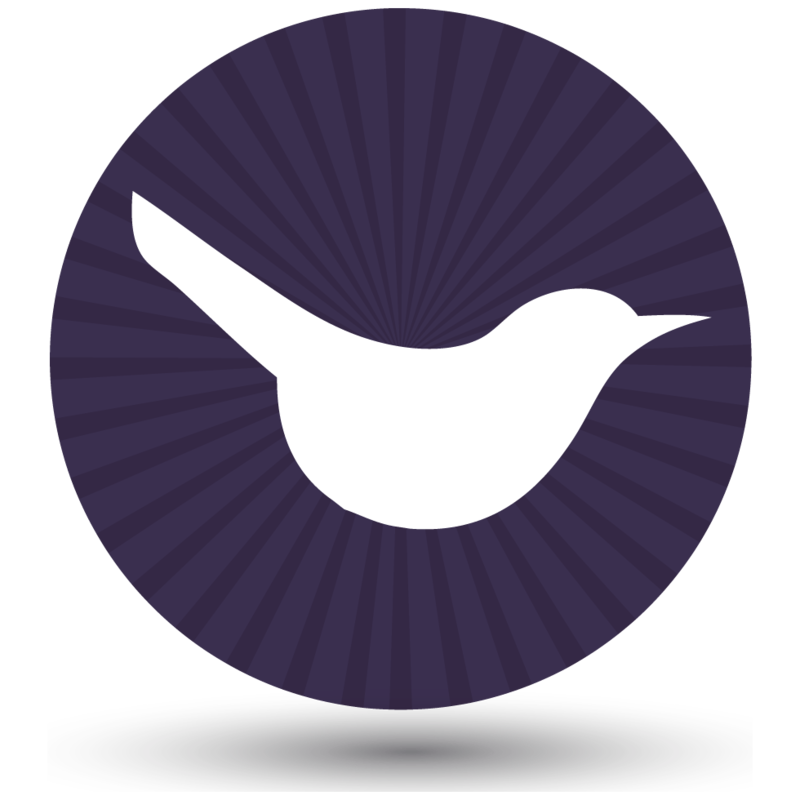 Personal blog: Create a private blog that’s hidden from search engines and share it with only the people you choose. Training: Offer online training either within a workplace or to subscribers – you can even include videos. If it’s for paid subscribers, you could also offer teaser training videos to encourage signups. Whichever usage you want, the process is identical. You might even choose a use case we haven’t thought of! That’s absolutely fine: the process is exactly the same, whatever you want to use your private blog for. In the next section, I’ll show you how to do this in practice: protect some of your blog posts, while keeping others public. Alternatively, if you’re interested in protecting your entire WordPress blog, you can skip ahead. For both, we’ll show you how to setup convenient login pages for your visitors, clients, and/or customers to smoothly access your content. If you want to keep some of your blog posts public while keeping others visible, you can change the visibility of selected blog categories. This lets you create a private area within your blog, which only specific users will be able to view. For example, you might want to keep paid content hidden while offering teaser blog posts, or have some areas of your blog only viewable by certain clients. Changing blog category visibility isn’t possible using the core WordPress software, so you’ll need the plugin Password Protected Categories. 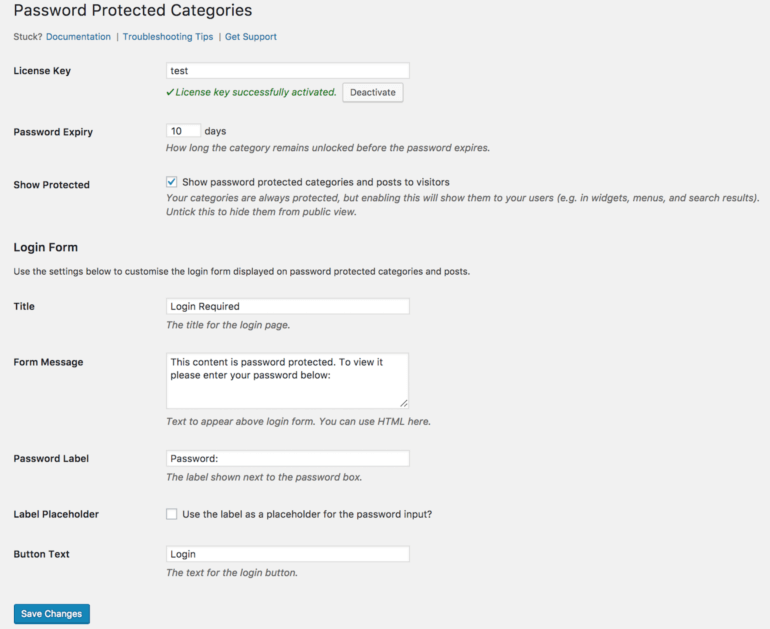 Password Protected Categories adds a visibility option to blog categories. This makes it easy to change the visibility of categories between Public, Password protected, and Private, just as you can with individual posts. It’s better than protecting individual posts because it actually hides them from your main blog page, and users can enter a single password to unlock the whole private WordPress blog instead of having to enter a password for each post. Either password protect blog categories so only people with the correct password will be able to view posts in protected categories. You can create as many passwords as you need without having to add lots of users who could potentially make unwanted changes to your website. Or set blog categories to private so posts are completely hidden from everyone except users logged into the WordPress Admin with Administrator or Editor roles. Firstly, buy the Password Protected Categories plugin. To upload the plugin file, go to Plugins → Add New and click Upload Plugin. Choose the plugin file from your computer and click Open. Click Install Now then Activate Plugin. You can let your readers self-register for private blog access by using the Theme My Login plugin to ensure your blog’s login page matches the rest of your site. Install the plugin, and activate. The plugin automatically generates a set of login pages, which you can find under Pages in the WordPress dashboard. You’re now able to send readers to the Register page, where they can self-register for access to your private blog. Use the TML icon on the bottom left of the WordPress Dashboard, and then click Enable user moderation to ensure you have full control over who can register for your site. You can use this capability in conjunction with with Password Protected Categories’ custom user roles to ensure subscribers, contributors, and other user levels have access to your content, and you have a full suite of private blog capabilities. Read on for more details on how to edit blog category visibility. You have two options: set blog categories to be password protected (below), or set blog categories to private (click to skip to this). A password protected blog is a great choice if you have more than a couple of people who’ll be reading your private blog posts. To password protect blog categories, you can create new blog categories and set their visibility to Password protected or you can edit the visibility of existing blog categories. To edit the visibility of existing categories go to Posts → Categories and hover over the category you want to change. Click Edit, scroll down to the Visibility section and select Password Protected. Type your password and click Update. To alter the login form message, or how long a category remains unlocked before a password needs to be reentered, head to Settings → Protected Categories. If you have blog content that you only want Administrators and Editors to access when logged in to WordPress Admin, you can set the visibility of your blog categories to Private. 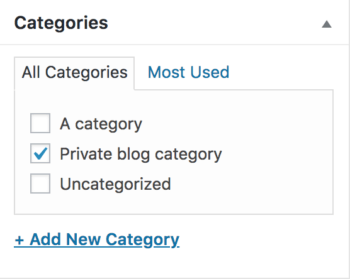 To set a blog category to Private you can either create new blog categories or edit the visibility of existing blog categories. To create a new blog category: in your WordPress Dashboard, go to Posts → Categories. Write the new category name and slug. Scroll down to the Visibility section, select Private and click Add New Category. To edit the visibility of existing categories go to Posts → Categories and hover over the category you want to change. Click Edit, scroll down to the Visibility section, select Private and click Update. Only those users with the correct administrative access will be able to view the categories with Private visibility, and only when they’re logged in. It’s often simpler to set visibility to Password protected if you have multiple users needing to access your private blog categories. You can then give passwords to approved users, which they’ll use to log in to view protected content on your site. Rather than making select blog categories private, you might like to create a standalone WordPress private blog that’s only visible to specific users. This is useful for workplace communication, or personal blogs for example. Again, it’s easy to do using the plugin, Password Protected Categories. The first step is creating private parent and sub-categories for your blog. The second step is to create a login page so users can login to gain access to your blog. Once activated, head to Settings → Protected Categories and enter your license key. There are two ways you could create an entirely private blog. One way would be to set the visibility of all your blog categories to either Private or Password protected. A much slicker way is to create a parent blog category with sub categories. In this case, users will be able to unlock the entire WordPress private blog, including all the sub categories, with one password. This means you have an entirely private blog, which is as easy to navigate as a public blog. Note, you don’t need to change the visibility of the sub category as, thanks to the plugin, it will already be password protected and only visible to users who have entered the parent category password. You can create as many additional sub categories as you like – think of these like the categories of a public blog. Head to Settings → Protected Categories. You’ll see the option Show Protected. This doesn’t affect the visibility of post content on your site. However it does affect whether your post categories and any blog titles within those categories are public. If you want people to be prompted to login when they try to access a post or category in your WordPress private blog, head to Settings → Protected Categories and ensure the Show Protected box is checked. Remember, they won’t be able to view the content of the posts unless logged in – only the information such as post titles and categories. When you select this option, your protected content will however be visible to RSS readers. If you don’t want entire posts to show in an RSS feed, head to Settings → Reading. Next to the option For each article in a feed, show, select Summary. This ensures only a summary or excerpt appears in RSS feeds. Read our Password Protect WordPress guide to learn about password protecting other areas of your WordPress website. To make it even easier for users to login and view your blog, create a centralized login page for your WordPress private blog. First, uncheck the box next to Show Protected. Your blog is now completely inaccessible on your website. If you preview the page, you’ll see your centralized category login page. Here users can login to view your blog. To change the message that appears above the login box, head to Settings → Protected Categories. Here you can edit the Form message. Alternatively, you can override the message by adding message="a different message" to the shortcode. You may wish to also add a link to the registration page we created earlier. Hit Publish. 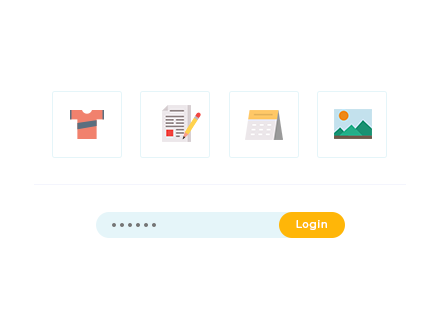 You’ll most likely want to add this login page to your menu so it’s easy for users to access. To do this, head to Appearance → Menus, select the page and click Add to Menu then Save Menu. Users get automatically redirected to the correct category page when they enter the correct password on the login page. You’re now set up with a private blog, complete with convenient login page for your users. Whether you’re building a subscription blog, community or membership site, need to communicate with your team or clients, or have any of the other WordPress private blog plugin use cases we outlined earlier, this tutorial has shown you all you need to know to create a private space for your content. We’ve looked at why you might want to create a private blog, and then how to do it. We’ve shown you how to use Password Protected Categories to make any part of your blog private, to achieve any of the use cases outlined above. You can get the plugin in order to put this into practice. Interested in making other parts of your blog password protected? 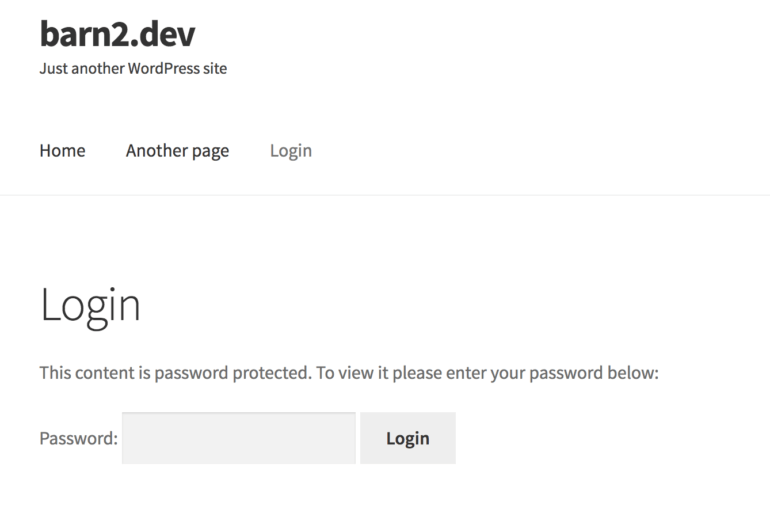 Read our Password Protect WordPress guide to learn how to make the rest of your site, or even your WooCommerce store, private. And, of course, let us know in the comments below if you have any questions about making your particular blog a private one. Thanks for reading!